Sorry for the light posting this month, unfortunately its our busiest month of the year, and its been bit frantic at the distillery. Its likely to continue like this until January, then I'll have more time for blogging! At any rate, here is the tale of one of my recent drinking-related adventures (still gotta find time for those). At the book signing last week (see Dec 7 post), we met two very fun guys named Sean Benjamin and Steve Mosqueda. They run the Drinking & Writing group, exploring the connection between alcohol and creativity. They put on a live, interactive theatre experience right now called Drinking & Writing Vol. 4, The Twelve Steps of Christmas. So of course we had to go check it out on Friday night. The show takes place at the Victory Garden Theater, next to the bar, and it starts around 10:30 pm. The bar is open, and drinking is encouraged. Steve and Sean drink beer, tell stories from their own holiday experiences, and talk about famous writers (with a focus on those who were known to drink). The show begins with a brief history of Paganism and Saturnalia, and the later development of Christmas. Sean and Steve even name their three wise men of drinking & writing, Charles Dickens, Frank Capra (for his movies) and Theodore Geisel (aka Dr. Seuss). One interesting factoid from the show was that Geisel actually changed his name in college (to Seuss, his mother's maiden name) after he was disciplined at Dartmouth for violating Prohibition. The show was a bit uneven, but very entertaining. It was definitely an interesting experience, and totally unlike any of the other live theatre shows I've been to, and I've been to quite a few. If you're in Chicagoland and you're interested, there's one more show left - it's this Friday night (Dec 21). You can visit their website or the theatre's for more info & tickets. And a 15-year old single malt that for which I neglected to write down the details (given that it was my 3rd drink, and all of these were cask strength, I have forgiven myself for that one). Too bad, since that one was my favorite. It was well structured, smooth and complex. Guess I'll have to go back to the Red Lion. 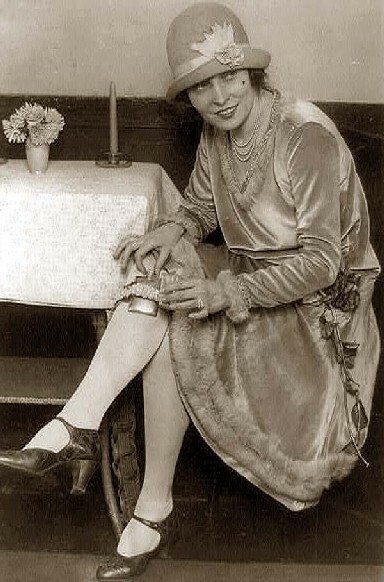 Unfortunately, the word about celebrating Repeal Day has not really caught on in the Windy City. I was in bars and liquor stores all over town on the magic day, and almost no one I encountered was aware that it was Repeal Day (and a few didn't know what it meant). Despite this, we decided that we should have our own cocktail bar tour to honor the day, and we had a fantastic time (and made some great plans for next year). Here's are a few highlights. I spent the day in the city, and had a little time to kill before my hubby would arrive by train. 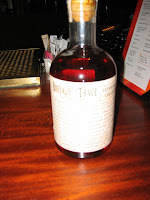 So why not visit our friends at the Weber Grill and try that Buffalo Trace Experimental Collection bourbon that's been calling my name whenever I see the menu? This one says its was transferred to a a French oak chardonnay barrel after 6 years, and was 14 years old at bottling. It claims to be from a sour rye mash. It was bottled at 45% alcohol. Tasting notes: The nose was very heavy with alcohol, more so than most spirits I smell. Adding some water seemed to help, but it still had a strong alcohol note. 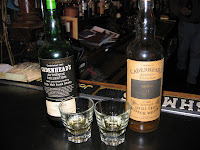 On first sip, it really didn't taste much like bourbon - it was a bit peaty and much drier than most bourbons. It was definitely fruity and spicy, with caramel notes. Not sure how I feel about this one. Anyone else tried it? Eric Felten (of the Wall Street Journal) was in town to sign copies of his book, How's Your Drink? What an appropriate event for Repeal Day! We had some amazing cocktails at the Drawing Room - they do everything by hand, using only fresh ingredients. 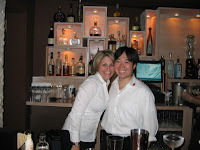 On an regular night, they would even do it tableside - they have portable bars. How cool is that? Here are a few pics from the signing. And yes, I need to work on my photography skills - I know you all wanted to see Eric Felten's back (photo at left). But I did get a great shot of Charles making a Brandy Crusta! It was quite cold on this night, so we didn't want to go far. We headed off to 676 Restaurant, 676 N. Michigan Ave., Chicago for a quick bite to eat (it was great). It was late, and it was a school night, so we headed home. Of course, we also made some plans for next year's Repeal Day... more on that later! Yesterday was the big day. We had to present our original cocktails for judging and take a written 100-question final exam. 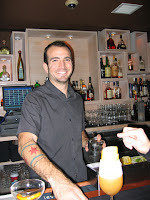 There were 12 drinks presented in total, using a wide variety of ingredients and garnishes. We were judged on technique (just the "lite" version, not nearly as tough as a true USBG competition), and then a sequestered panel of judges rated the drinks based on appearance, aroma and taste. Shake bourbon, liqueur, juice and bitters together, strain into ice-filled tall glass. Top up with club soda. Garnish with an orange wheel and flower (my actual garnish had a purple flower, but I couldn't find any of them near my house and I wasn't able to get a photo during the competition). Well, I didn't place in the top three. However, word on the street is that I came in fourth place. I feel pretty good about that, given that I've never been professionally behind the bar and most of my classmates make beverages professionally every day. The top spot went to Angie Jackson of Ultimate Elixirs. Congrats Angie! The prize for winning? Angie gets to showcase her talents and her drink at graduation. Her cocktail looked fantastic, and I am looking forward to tasting one at our graduation ceremony next week. I am certain that I got at least a 75% on the final (I am always a bit of an overachiever on tests), so I am looking forward to graduation. This has been a great learning experience and I've made some great new friends along the way. Here are a few of the interesting tidbits I learned while studying for the final, just for fun. Drinks should be built in the glass half of a Boston Shaker so that you (and the customer) can see what's happening and you can measure by sight. USBG rules stipulate that you should pour the least expensive ingredients first, working your way toward the most expensive. That way, if you make a mistake along the way, you can minimize the cost of rebuilding the drink. It is rude to point your shaker toward a judge in competition, you should always shake to the side. As one of our judges, Debbie Peek from the Drawing Room pointed out, if you should ever have an accident, the drink would spill right onto the judge if you point it at him/her (ouch!). Cognac producers add caramel coloring to their products, its just part of the production process for most if not all of them. A frozen mug is about the worst thing you can do to a beer, it will cause some of the beer to freeze and the beer won't be at its best temperature. Use a chilled mug, but not a frozen one, for a cold one. To learn more about this class and to sign up for the next term, visit the Illinois Chapter of the USBG and click on "Membership." The class runs every few months, and they rotate between downtown Chicago and Bolingbrook. 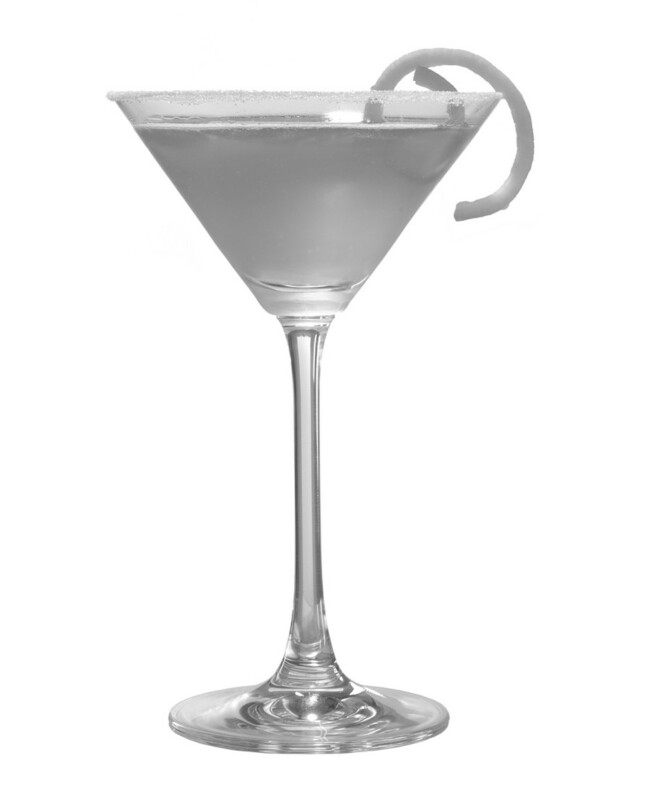 Mixology Monday - Repeal Day! Its another Mixology Monday, and this month's theme is Repeal Day. Our host is Jeffrey Morgenthaler, the creator of the Repeal Day website and a great mixologist, writer and blogger in his own right. For a quick history on Repeal Day (December 5th), which marks the anniversary of the end of Prohibition in the U.S.A., please visit the official Repeal Day site. Jeffrey has done a terrific job setting out what its all about, so no need to repeat it here. Being in Chicago, which was one of the hotbeds of the alcohol business during Prohibition, I struggled with what to write (plus its been a very busy week). I decided on a couple of cocktails, one for "hooch" and a decent one from the Prohibition era. My trusty copy of the Savoy Cocktail Book contains a section I've never visited before, entitled "Cocktails Suitable for a Prohibition Country" (p. 184). One of these cocktails is similar to other drinks I've made, so I thought I'd give it a whirl. Since this was suggested as a cocktail to make in a Prohibition country (the next one in the book actually calls for "hooch whisky"), I decided to make it with the gin in my collection that I like the very least. I guess I won't call it out by name (okay, I will - its Leyden Gin). Eh. It was better when we made it with a better gin, but it was only so-so. It seemed like it would require some tinkering to get it where you'd want to make it over and over again. Just for fun, I thought I'd throw in a cocktail that I often enjoy that was created in the early 1920s, most likely by Harry McElhone (per Ted Haigh's excellent tome, Vintage Spirits & Forgotten Cocktails). As a few other bloggers found, there doesn't seem to be much other use for that bottle of Parfait Amour I bought awhile back, so I make this drink periodically. Shake all ingredients with ice, then strain into cocktail glass. Do measure the ingredients on this one! Happy Repeal Day, don't forget the toast on December 5th! Note: pictures in this post are from www.old-pictures.com and www.istockphoto.com. I'm having some photo difficulties and wanted to get this up by midnight my time!